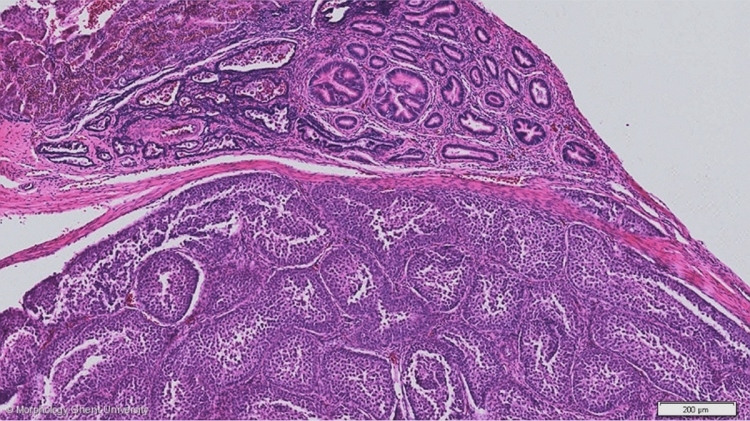 The testes of birds are situated intra-abdominal and are surrounded by only a thin tunica albuginea and the peritoneum. The tunica does not give off many septa so the testes are hardly divided in lobules and are much softer to the touch than the testes of mammals. Outside the breeding season, the testes of most birds are inactive and small. The epididymis is poorly developed, lies closely to each testis at the medial side and can not be divided in a caput, corpus or cauda. The rete testis lies in between the testis and epididymis. The adrenal glands are frequently lying very closely to the testes.